International team of authors examines the social issues of contemporary Europe, as well as the options of solving the present social problems in the future, while exloiting the knowledge and the experience of the countries of Central Europe during the past twenty years. 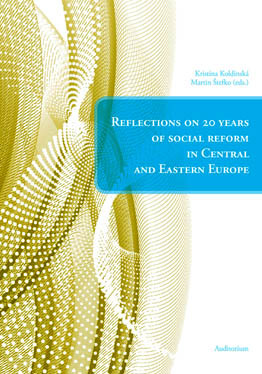 The authors also take into account the experience from the economic transition period of the post-communist countries. The main topics of the book are equal opportunities and discrimination, health care reform and pension reform, new models of the welfare state and more. The book was also published in Czech language. holds a PhD (Dr. iur. utr.) from the Law Faculty of the University of Würzburg (1989), and a LL.M. (Diploma of Comparative European and International Law) from the European University Institute (EUI = German EHI) in Florence (1991); he took his habilitation in Public Law, European Law and Social Law with the Law Faculty of the University of Würzburg (1994). From 1996 to 2002, he was holder of the Chair for Public Law, German and European Social Law at the Law Faculty of the University of Regensburg. Since 2002, he has been a Scientific Member of the May Planck Society and Director of the Max Planck Institute for Foreign and International Social Law in Munich (http://www.mpisoc.mpg.de), and also Honorary Professor for Public Law, European Law and Social Law with the Law Faculty of the Ludwigs-Maximilians-University Munich. is Professor of Economics at the Sapienza University of Rome and Visiting Professor at ULB (Department of Applied Economics). She holds a Ph.D. in Economics from the University of Manchester (UK) and a degree in Statistics/Economics from University of Rome “La Sapienza”. She is currently scientific coordinator of EGGSI - Network on Gender Equality, Social Inclusion, Health and Long-term Care (from nov. 2007) on behalf of European Commission, DG Employment and Social Affairs and core member of the Research Working Group of the European Microfinance Network. In the past, she has carried out several research projects (e.g., about financial exclusion and microfinance, women empowerment, and migration) at international level. She has worked as consultant for OECD, European Parliament and European Commission, and for several Italian institutions. is a sociologist, Head the European Social Policies Research Unit and Project leader, carrying out research, evaluation and monitoring activities in social policies and services on emerging questions concerning the social exclusion and the social protection system. She is the operative coordinator of the European Commission funded Experts Network in gender equality, social inclusion, health and long term care (EGGSI) carrying out, as co-author, several studies: “Ethnic Minority and Roma Women: A Case for Gender Equality?” in 2008, “Access to Healthcare and Long-Term Care: Equal for Women and Men?” in 2009; “Position Paper on Monitoring Progress towards Gender Equality” in 2009; “Violence Against Women And The Role of Gender Equality, Social Inclusion and Health Strategies” in 2010. Since 2005 she has coordinated several studies for the European Parliament, amongst others: “The inclusion of social elements in Impact Assessment” (2005) “The costs of childcare in the European Countries” (2006) “The role of minimum income for social inclusion in the European Countries” (2007); “Illness at workplace in the European Countries” (2008); "The social situation of the Roma and their improved access to the labour market in the EU" (2008); “EU cooperation in the field of social inclusion (2009)” . is senior lecturer of Labour law and Social security law at the Faculty of public administration of the University of P. J. Šafárik in Košice and external teacher as a senior lecturer at the Catholic university in Ružomberok. He holds a Ph.D. in Labour law from the Faculty of law of the Trnavská University (SK) and he is also a member of the Resort Commission in the scientific branch “Labour law and Social security law“ there. He is currently member of the Permanent Commission of the Committee for social affairs and living of the National council of the Slovak republic and statutory and partner-solicitor in the East Lawyers-solicitor´s Office, Limited liability company with the seat in Košice. He is author of Commentary to Act no. 5/2004 Z. z. as amended (Act of employment services) and lead co-author of a book entitled Commentary to Act no. 311/2001 Z. z. as amended (the Labour Code of the Slovak Republic). In the past, he has carried out some research projects (e.g., about contractual model, limits of contractual freedom and flexicurity, employment services and activating measures) at national level. He has worked as external consultee for the Constitutional Court of the Slovak Republic. He is a labor law specialist and his long term research interests include state social benefits and legal determinants of social security. He is involved in scientific projects on the legal aspects of development of employment services in the context of reforms of public administration. is a Ph.D. fellow at Tilburg University, Law School, the Netherlands. She is writing her dissertation on the effect of ILO and CoE standards on the development of the social security systems in the Czech Republic and Estonia, to be published in 2011. The underlying objective of the research is to see to what extent the international standards contribute to the progressive development of social security in EU Member States and to the establishment of a European minimum level of social security. She participates in the projects “Europe and Social Security” of Tilburg Law School, and “International Standards-Setting and Innovation in Social Security” of the Max Planck Institute for Foreign and International Social Law (München). She also teaches Dutch labour law. held from 1989 until 1997 the Chair for Civil and Social Law at the University Osnabrück, from where he moved to Jena’s Friedrich-Schiller University in 1997. In 2003 prof. Eichenhofer was awarded with an honorary doctorate by the University of Göteborg. He published a lot of articles and books on social law, coordination of European social security, European social law. He is member of editorial boards of several important reviews and journals. practised law for a short time. In 1990 he was appointed assistant professor of the Department of Labour Law and Social Security at “József Attila” University, later the Szeged University. In 1998 the Szeged University conferred upon him the title of Doctor of Philosophy (Ph.D.) in Political and Jurisprudential Sciences. In 2004 he committed his habilitation and the Szeged University conferred upon him the habilitation title in Jurisprudential Sciences. Professor Hajdú is member of the Executive Committee of the International Society for Labour Law and Social Security. He is the author of books and articles in the ?eld of Labour Law and Social Security. Professor Hajdú is Vice-President of the International Society for Labour Law and Social Security. He is President of the Hungarian Society for Industrial Relations. He has lectured in many countries. He has been involved in some international research projects. At present he is the head of the Department of Labour Law and Social Security in the Faculty of Law at the Szeged University and simultaneously he is the head of the Department of Labour Law and Social Security in the Faculty of Law at the “Károli Gáspár” Protestant University, Budapest, Hungary. He is the Director of the Institute of Industrial Relations and Social Security College Education, at the Szeged University, Szeged, Hungary. Mgr. in Law (2004) and JUDr. (2005) - Faculty of Law at Charles University in Prague; LL.M. in European Integration (2008) - Europa-Institut of Saarland University; MSt. in Legal Research (2010) – University of Oxford) is a DPhil student at University of Oxford, Faculty of Law and the CSET Teaching Fellow in EU Law there. In the Czech Republic, Barbara collaborates with various women and human rights NGOs on monitoring and advocacy projects in the area of gender equality and teaches a course on Gender and Law at the Faculty of Humanities at Charles University in Prague. Barbara worked for Clifford Chance Prague, trained at the Legal Service of the European Commission and in the Chambers of AG Poiares Maduro at the Court of Justice of the European Union, and worked at the European Law Department of Saarland University. She visited several law schools as a guest student/researcher, including Universita di Siena, Zagreb University, Harvard University and University of Michigan (the latter as a Fulbright scholar). Her academic interests include EU law, labour law, equality law and gender legal studies. is a Senior Lecturer at the Charles University Faculty of Law. Since 1997 she works at the Department of labour law and social law, where she teaches social security law and labour law and she guarantees and teaches courses on coordination of social security in the EU and on EU social law. She publishes extensively in Czech Republic (especially with the publishing house C.H.Beck) as well with various foreign publishing houses (Ashgate, Routledge) and legal reviews. Her reseach interests include social assistance, gender equality, EU social law, coordination of social security. In 2005-2006 she worked in Georgia as a legal expert of EC Commission where she contributed to adoption of a new act on social assistance. She is a member of Commission‘s Network of legal experts in the fields of employment, social affairs and equality between men and women and TRESS (Training and Reporting on European Social Security), where she was a member of think tank in 2009. Both long-lasting projects run by prestigious European universities and financed by the EU Commission. is Associate Professor of Labour and Social Security Law at the University of Ljubljana. She works at the Faculty of Social Work and the Faculty of Economics as well as at the Institute for Labour Law at the Faculty of Law, University of Ljubljana. She has participated in different international and national seminars and congresses as well as in different research project dealing with issues of labour law and social security. She is the author or co-author of many legal books (15) and articles (over 60) in this field. She has been a guest lecturer at the University of Umea and University of Juväskylä. She is an editor-in-chief of the Slovenian Labour Law and Social Security Review ‘Delavci in delodajalci’ (Employees & Employers), published by the Institute for Labour Law in Ljubljana. Recently, her scientific research has been focused especially to the following issues: termination of employment, flexible forms of employment (fixed-term contracts etc. ), discrimination in employment and fundamental social rights. is Director of the IRS Labour Market Research Unit, lecturer of “Public Economics” at the LIUC University and of “Labour Economics” at the Catholic University of Milano and at the University of Lubljiana. She holds a MA in Economics (University of Michigan, USA). She has directed many research projects and evaluations in the labour market and employment policy field, with focus on the comparative analysis of labour market regulation and industrial relations systems, the assessment of labour market trends and transitions, gender and migration issues in the labour market, the evaluation of labour and social policies and of European Programmes and Structural Funds. She has been involved as expert in different European networks and peer review programmes. Since Nov. 2007 she is co-coordinator of the European EGGSI network (Expert Group on Gender Equality, Social Inclusion, Health and Long Term Care) and has co-authored the EGGSI Synthesis Reports on: Ethnic Minority and Roma Women: A Case for Gender Equality? (2008); Access to Healthcare and Long-Term Care: Equal for Women and Men? (2009); Violence Against Women And The Role of Gender Equality, Social Inclusion and Health Strategies (2010). is a Senior Lecturer at the Charles University Faculty of Law, a Fellow at the Max Planck Institute in Munich and a Guest Professor at NOVA Southeastern University in Florida, USA (2009). He holds a degree as “Doctor of Law” (2003) and a Ph.D. degree (2005), both from Charles University. Martin Štefko teaches a variety of courses in labour law as well as in social security law. He is also the coordinator of the human resources and public employment policy course. His primary research interest is the Posted Workers Directive and its implementations in EU Member States but he is also active in topics on the relationship between civil law and labour law and immigration law. In his spare time, Martin Štefko has written more than 90 articles published in various legal journals. He has also written, jointly or individually, 20 books concerning labour law and social security law. He also works as a law adviser at the Czech Social Security Administration in Prague and is an honour member of the Expert Board at the Labour Office of Prague. is Jean Monnet Professor of European Labour Law and Social Security; Head of the Chair of Labour Law and Social Policy, Faculty of Law and Administration, Jagiellonian University, Krakow, Poland; Vice president European Committee of Social Rights, Council of Europe; Judge ad hoc, European Court of Human Rights.